The long-awaited report into the British Army Bloody Sunday massacre will not be released by the current British government, it has emerged. British Direct Ruler Shaun Woodward confirmed that British government officials are this week beginning checks of the 5,000-page document for potential “security issues”. British military intelligence chiefs, who are closely involved in the scrutiny of the document, are said to have requested the delay. 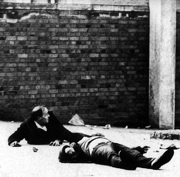 The families of those killed and injured want an early publication of the report of the public inquiry, the second to be held into the British Army shootings which left fourteen dead at a civil rights demonstration in Derry in 1972. A group of relatives met with British Prime Minister Gordon Brown as recently as last week to discuss their concerns over the handling of the matter. The announcement confirmed fears among relatives of those killed that British military intelligence is seeking to censor, delay and ‘spin’ the report. “We ask, is it fair that the British government get advance access to the report, advance possibility of preparing a response, with the possibility of changing Lord Saville’s report itself?” they said in a statement. It was reported that four copies of the report will be produced -- two for the British vetters and two for the inquiry. However, the announcement by Saville that government officials can scrutinise the report only while it is still in his formal possession was welcomed by the familiies. Woodward claimed relatives of the bereaved and injured, plus soldiers involved in the inquiry, would be given access to the report on the day of its eventual release. “Publication of the report of the Bloody Sunday Inquiry has been long-awaited and it promises to be a hugely significant event in Northern Ireland’s history,” he said. “But this is also an occasion that will have an enormous impact on the private lives of ordinary people. Woodward said he wanted to publish the report in full, but said he would remove extracts where advised necessary “to ensure the safety of individuals”. The Saville inquiry was set up in 1998 to re-examine the events of January 1972, when soldiers from the Parachute Regiment opened fire on civil rights demonstrators in the Bogside area of Derry. It was established after the original Widgery Inquiry in the wake of the killings was widely dismissed as a whitewash. Derry MP Mark Durkan criticised the today’s announcement, which he said would bring new questions over the future of the report and fresh uncertainty.